Does your clinical trial website intrigue potential patients and spark an interest in participation? Or does it drive them away and have them looking for other treatment options elsewhere? Your trial’s website is your public representation and should be an extension of everything you strive for: professionalism, expertise, dedication, and trust. The website is often the first place that patients will be introduced to and get familiar with your trial – make the best first impression that you can. Clinical trial information can come across as overwhelming to a patient visiting your website for the first time. Information should be concise, appearance should be clutter-free, and navigation should be easy. Think about age, gender, accessibility, and requirements of the demographic that you are trying to reach. Take the time to really plan out how to the appearance, function, and content of your website can all come together to provide a patient-friendly experience. Every company with a website can benefit from hosting a blog. As a means to gain digital traction, the blog will play a very important role in your overall social media and SEO (Search Engine Optimization) strategies. You can spark conversations and show that you are a reputable community presence. Post content that shows off your expertise and establishes trust. Additionally, make sure that content is easy to read or watch. Internet users have incredibly short attention spans, so you really want to make the time you have with them count. Here are some tips on “snackable” content: stick with short sentences, break up content into shorter paragraphs, keep videos brief, and utilize bulleted lists! Again, people browsing the internet tend to have short attention spans. A surefire way to lose visitors is a slow, lumbering load time for any page. People get bored, lose interest, get annoyed and they’re off to another site – perhaps that of a competing trial. 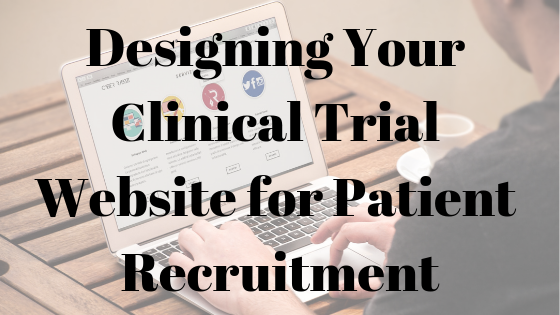 Find your ideal clinical trial candidates by creating a website that provides an enjoyable and stress-free experience. A site that is informative, professional, and engaging will help to establish trust in your trial and encourage visitors to take the next step toward becoming a patient. Need help with your clinical trial? Contact us here!